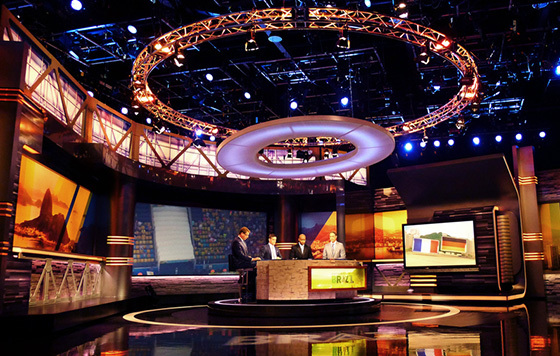 The World Cup is well underway in Brazil, and some 5,000 miles away the CBC is bringing fans coverage from its technology-driven studio in Toronto. Upcycling was a key strategy behind AKA Creative Group’s design for the set. The concept is not a new one, but many networks and stations don’t like to admit that sometimes budgets and timelines are an issue. “We had to be very clever about recladding and refinishing elements to make them look new. We relied on graphics and lighting to help tell a new story with an existing set infrastructure,” said Sanvictores. Reusing elements from their 2010 World Cup set as well as technologies from their studio returning from the Sochi Olympics, AKA was able to transform and create a unique look that embodies the energy and feel of the host nation, Brazil. The country is a vibrant patchwork of cultures and landscapes: beaches, mountains, jungles and cityscape. Sanvictores said the design seeks to capture that feeling of intersection and diversity. References to stadium structures are gritty and raw and evoke the feeling of being in the stands one of the 12 football venues. Large video backdrops behind the main desk connect the studio to the various locations around Brazil. 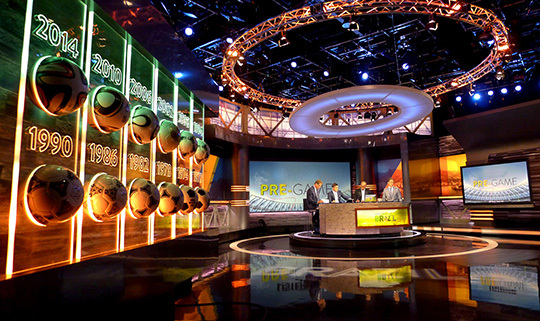 A large 4 x 4 video wall was installed adjacent to a football pitch area for stand up play-back analysis as well as double enders. The set includes an interactive touch screen for play specific breakdowns and recaps. A unique foreground element was designed using 12 historic balls from the past World Cups designed by Adidas. “We can really appreciate the work that goes into the ball design, their job is a lot like ours in that they provide a functional design that carries a significant symbolic narrative that is unique to the host nation,” said Sanvictores. 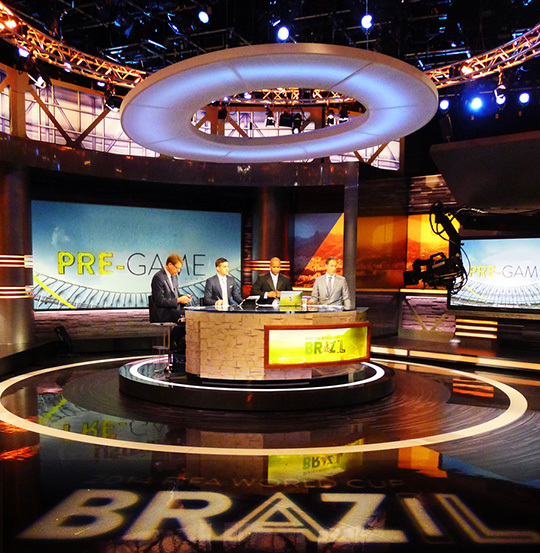 Overall, the set design captures the spirit of Brazil and the games while also saving the broadcaster money, a win win.